Although Udo may seem a miniature version of Jeju you won’t find any Teddy Bear Museums, Crocodiles Towns or beer and soju hofs on Udo. That’s not necessarily a bad thing. 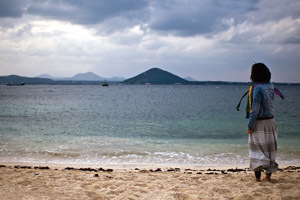 The small island offers walks with panaromic views back to the mainland and a beach unlike any found in Korea. You can rent a scooter or bring your car, but it’s easy to travel the island by foot. Its small, and not too hilly so you can take in the sights at a leisurely pace. You can get a good impression of Udo and its size if you climb up its Udobong peak. From there you can see the entire island and you can also see Seongsan Ilchulbang very near to Udo. There are about 1800 residents, and around 700 houses on Udo. 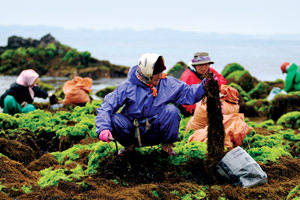 ▲ Udo villagers gather seaweed, a staple on the island. Photo courtesy Media Jeju. “Popcorn Beach” features a “mysterious” ever-growing popcorn-shaped sand. It is in fact a type of white coral, but each grain is expanding all the time. It’s the only one of its kind in Korea. 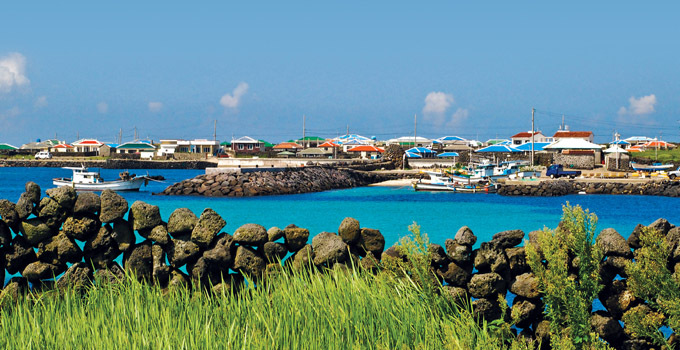 Jeju and Udo’s countryside share many similar sights. On Udo you can find scenic small paths and tracks that wind amongst the farms. 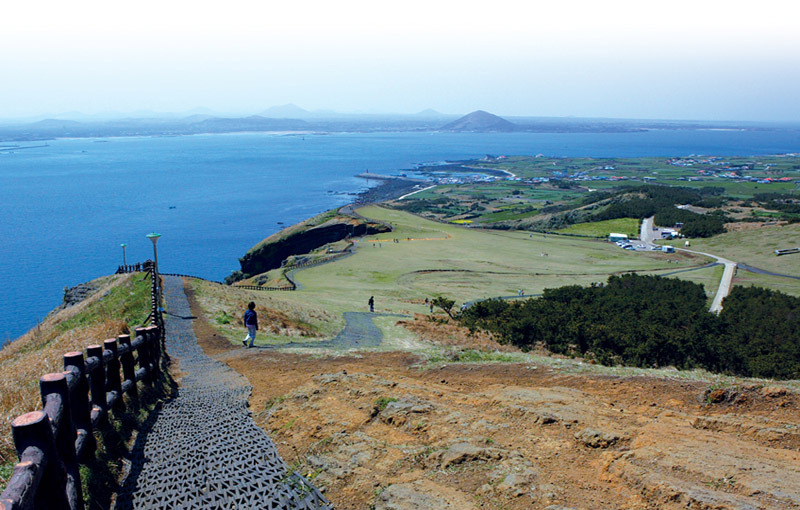 Udo, like Jeju is also very fertile and you can see all types of crops and seasonal vegetables being grown. Small rock mounds can be found on the stone beaches and hidden in unlikely places. Its considered good luck if you can build and balance your own. Large stone mounds also dot the island. They were originally built by the townsfolk to protect against bad omens, and bring good energy to natural areas. Now they, and other aspects, reflect a part of Jeju culture that is struggling against the encroachment of materialism with the younger generations. The stone walls on Udo are particulary breathtaking, especially at night when the moonbeams shining through the stones’ gaps prove one of the very qualities that makes Udo special; its unexpected beauty. Udo has very few street lights and the light pollution is minimal, so expect some full on star-scapes. You won’t find too many tourists on Udo, but they do exist. The island has numerous hotels and minbaks, and for a more “authentic” experience look for the small, family run minbaks. The hospitality you receive and the chance to sleep in a local house is well worth it. The price is also right, at around 15,000W. The journey to Udo is an easy one. From Seongsan port take one of the regular ferries to Udo. On the island the best way to get around is by scooter. You can rent one at a bike shop near Udo port, but it is pricey. A cheaper alternative would be to rent one off the mainland for the day and ride it on the ferry over there (check www.jejubike.co.kr). Udo definitely has an undeniable charm, and it remains a getaway for anyone who wishes to experience a taste of real “old world” Jeju life. Car ferry departs hourly from Seongsan port for 15 minute trip, from 8 a.m. to 4:30 p.m.
Return ferry departs Udo hourly 7:30 p.m. to 6 p.m.
For information call Udo Cheonjinhang Port ticket booth at 064-783-0448. In Korean only.